A superconducting “synapse” that “learns” like a biological system, operating like the human brain, has been built by researchers at the National Institute of Standards and Technology (NIST). The NIST switch, described in an open-access paper in Science Advances, provides a missing link for neuromorphic (brain-like) computers, according to the researchers. Such “non-von Neumann architecture” future computers could significantly speed up analysis and decision-making for applications such as self-driving cars and cancer diagnosis. Superconducting devices mimicking brain cells and transmission lines have been developed, but until now, efficient synapses — a crucial piece — have been missing. The new Josephson junction-based artificial synapse would be used in neuromorphic computers made of superconducting components (which can transmit electricity without resistance), so they would be more efficient than designs based on semiconductors or software. Data would be transmitted, processed, and stored in units of magnetic flux. The brain is especially powerful for tasks like image recognition because it processes data both in sequence and simultaneously and it stores memories in synapses all over the system. A conventional computer processes data only in sequence and stores memory in a separate unit. 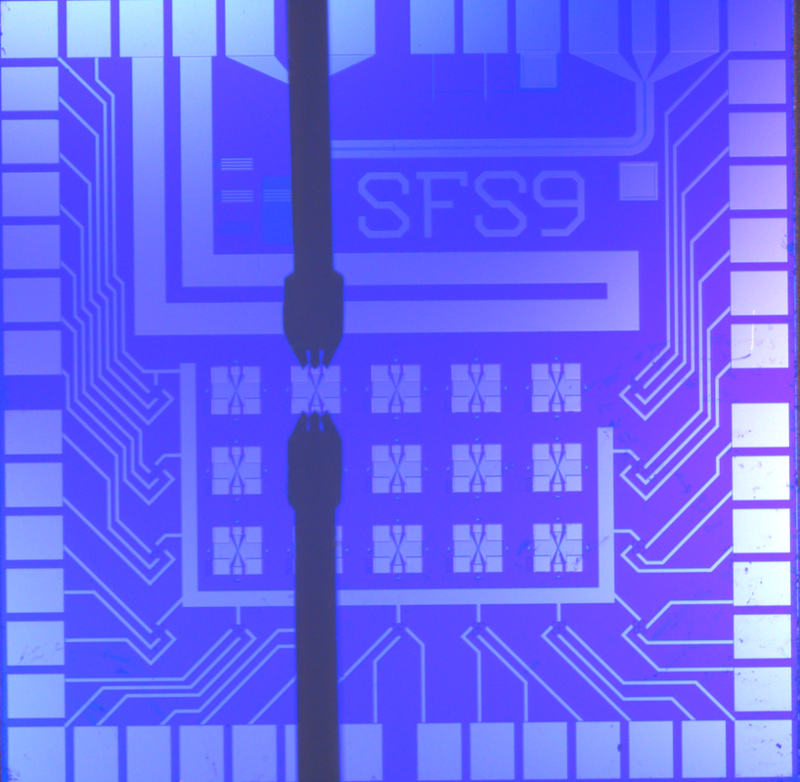 The new NIST artificial synapses combine small size, superfast spiking signals, and low energy needs, and could be stacked into dense 3D circuits for creating large systems. They could provide a unique route to a far more complex and energy-efficient neuromorphic system than has been demonstrated with other technologies, according to the researchers. 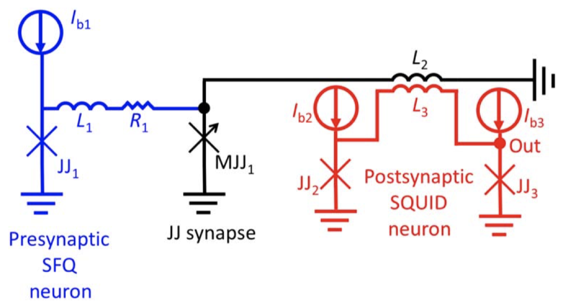 The NIST synapse is a customized Josephson junction***, long used in NIST voltage standards. These junctions are a sandwich of superconducting materials with an insulator as a filling. When an electrical current through the junction exceeds a level called the critical current, voltage spikes are produced. Each artificial synapse uses standard niobium electrodes but has a unique filling made of nanoscale clusters (“nanoclusters”) of manganese in a silicon matrix. The nanoclusters — about 20,000 per square micrometer — act like tiny bar magnets with “spins” that can be oriented either randomly or in a coordinated manner. The number of nanoclusters pointing in the same direction can be controlled, which affects the superconducting properties of the junction. The synapse rests in a superconducting state, except when it’s activated by incoming current and starts producing voltage spikes. 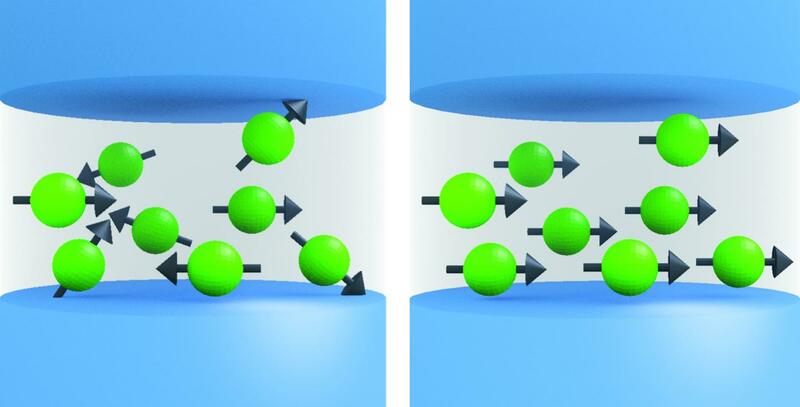 Researchers apply current pulses in a magnetic field to boost the magnetic ordering — that is, the number of nanoclusters pointing in the same direction. This magnetic effect progressively reduces the critical current level, making it easier to create a normal conductor and produce voltage spikes. The critical current is the lowest when all the nanoclusters are aligned. The process is also reversible: Pulses are applied without a magnetic field to reduce the magnetic ordering and raise the critical current. This design, in which different inputs alter the spin alignment and resulting output signals, is similar to how the brain operates. * Future exascale supercomputers would run at 1018 exaflops (“flops” = floating point operations per second) or more. The current fastest supercomputer — the Sunway TaihuLight — operates at about 0.1 exaflops; zettascale computers, the next step beyond exascale, would run 10,000 times faster than that. ** An attojoule is 10-18 joule, a unit of energy, and is one-thousandth of a femtojoule.